BONAIRE/PHILIPSBURG–United Democrats leader Theo Heyliger has resigned from the helm of the party with immediate effect. 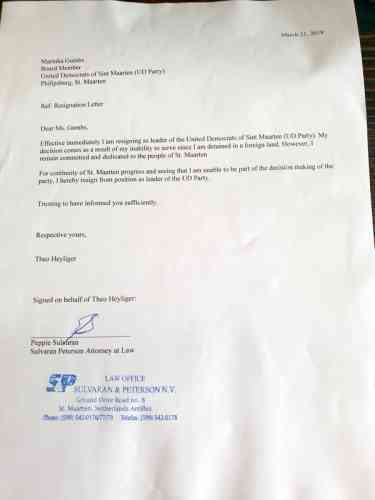 The resignation letter, dated March 21 and signed by on behalf of Heyliger by his lawyer Eldon “Peppie” Sulvaran, was sent to United Democrats board member Marinka Gumbs. Heyliger’s resignation leaves the party in the hands of deputy leader Member of Parliament Sarah Wescot-Williams. This can be considered a scenario in which history has repeated itself. Heyliger’s grandfather the late Dr. Claude Wathey was also enwrapped in a legal battle prior to his death. He also relinquished his leadership of the Democratic Party he co-founded to Wescot-Williams in the late 1990s. Heyliger is suspended from Parliament due to charges of corruption and money-laundering levied by the Prosecutor’s Office in the investigation codenamed “Larimar”. He is currently held in pretrial detention in Bonaire.